Today I am featuring the Garden Topiary stamp set and coordinating Garden Topiary SugarCuts. As I alluded at the end of my post yesterday, I used this stamp set in a bit of a unique fashion, and am kind-of thrilled with out it turned out! Before I get to my card, I wanted to invite you to follow me on social media. This is a great way to keep up with me, my latest creations & new product that I work with! Now on to my card! So, a trend in the wedding industry has been to decorate thin wooden hoops with real flowers & accents in their wedding color palette. When I saw this set, I thought it would be interesting to stamp one of those hoops instead of as topiaries. Check it out! To start I cut & folded an A2 card from white heavyweight cardstock. Then I cut a block of cashmere cardstock slightly smaller, and adhered it to the middle of the card. Next I diecut the scalloped rectangle using the Card Front Element Builder SugarCut that we revealed earlier this week from kraft cardstock. 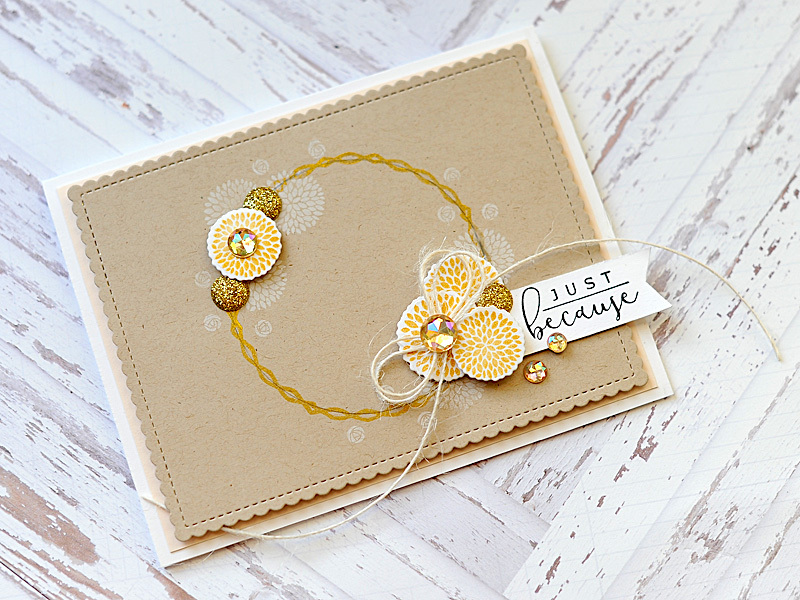 Next I stamped the hoop in golden glitz ink & some of the flowers in white pigment ink to the middle of the kraft scalloped rectangle, and adhered the entire block to the card base on foam. 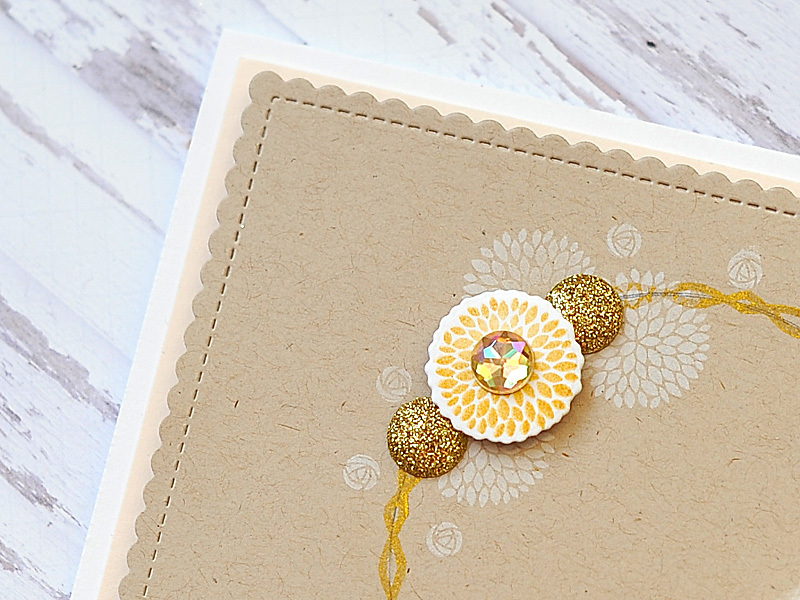 Then I stamped the round flowers to white cardstock in golden glitz ink & diecut them. I arranged them to 2 corners of the hoop, popping some of them up with foam dots. 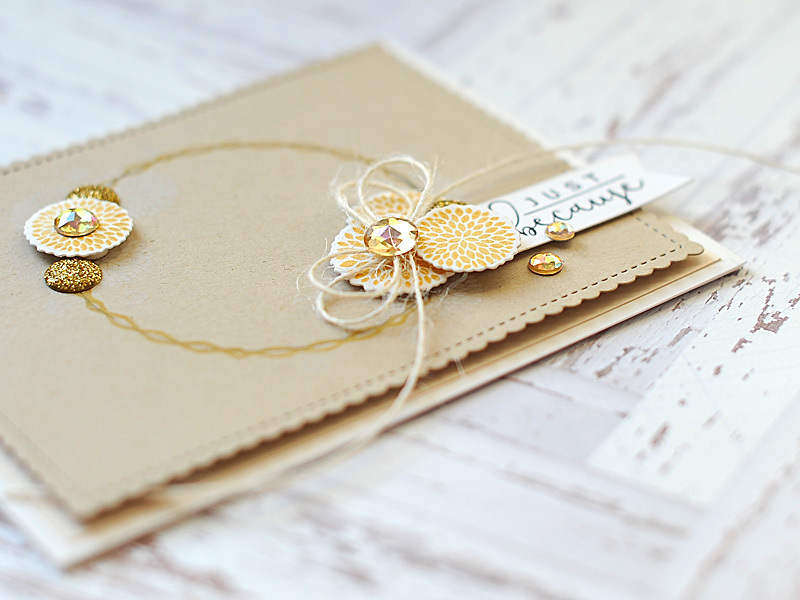 I then tucked a few gold glitter dots into the round flowers. After that I stamped the sentiment to a strip of white cardstock in onyx black Versafine, cut a banner edge to the right side & tucked it into the larger floral grouping. Then I tied a double bow from ivory burlap twine and adhered it to the front. 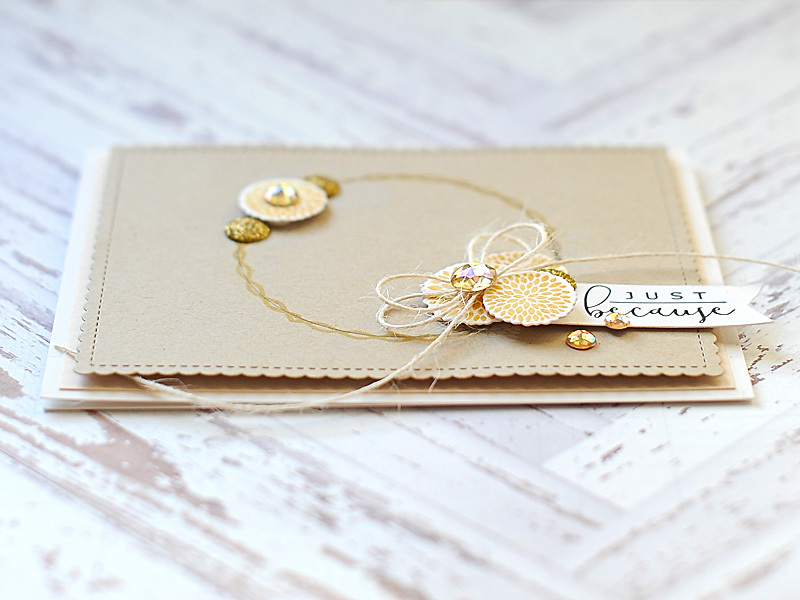 To finish, I accented the card with my signature jewels here & there. 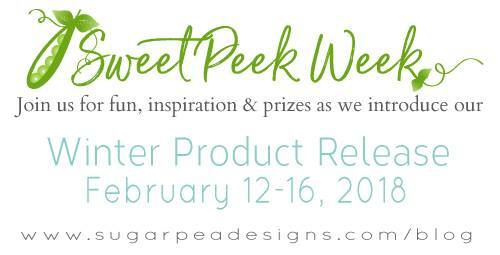 Click on the banner above to take you to the SugarPea Designs blog, where you can learn more about today's products, and leave a comment for your chance to win the Garden Topiary stamp set. Be sure to hop along & check out all the amazing creations from the SPD designers & guests - leaving a comment at our blogs gives you extra entries into the giveaway! I will be back tomorrow with another card featuring brand new products from the final day of our winter product release at SugarPea Designs! A beautiful card that would be sure to make the day of anyone who received it. Love the glittery touches that take it over the top. A beautiful calming card. Love the design and the stamps! This a very beautiful card. 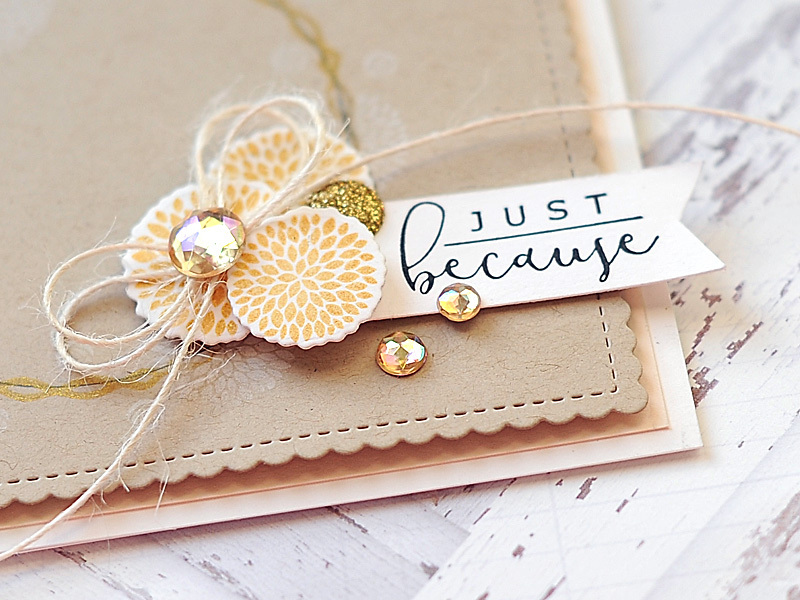 I like that you paired craft cardstock with gold, glitter, gems. Lovely card! Beautiful colors and embellishments! Great use of this lovely stamp set! Love it! The colour palette is gorgeous, as is your unique take on this set. So beautiful with the neutral colors and the jewel accents. Wow, really different and interesting..love the little clusters of prettiness! I love the way you think (design) out-of-the-box! So glad you're back to posting regularly. my favorite card this hop. Love this set!! this is beautiful and delicate!!! What a beautiful and unique take on the stamp set. I love all the layers and little details you added. Stunning! I really like the design, and the use of multiple elements from this release. Very, very nice!! 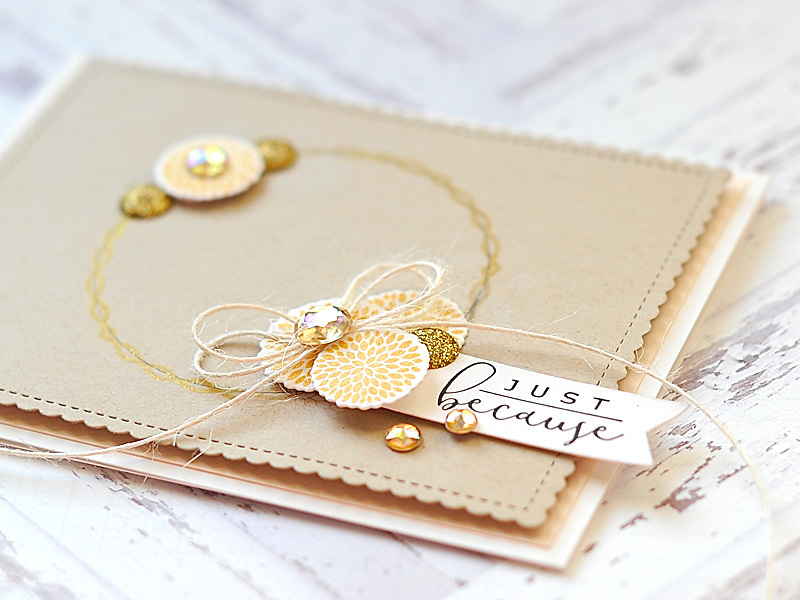 This is beautiful in yellows and golds! Love! How pretty - so sweet and delicate. Lea, this is so pretty and clever! What a creative take!! So pretty! A very cute and creative way to use this stamp set! I was drooling over this as soon as I saw it! So clever and creative! That’s such an elegant card design !